Semi-pro gas pressure washers may feature more than twice as much cleaning power as an electric unit. So if you're taking on big jobs regularly, gas-powered washers can clean much more quickly. 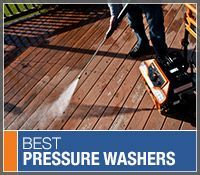 Equipped with higher quality pumps and engines, you can run these pressure washers all the time without concern. Cleaning vehicles, farming equipment, and the siding of a large home can all be accomplished in no time with a gas semi-pro power washer.